Provide your feedback on the annual conference! Welcome to the 2018 NC-IPMA annual conference! Please complete an online evaluation following each conference session. If you include your name on your survey, you will be entered into a special prize drawing. You will be entered once for each survey that you complete.Thank you for taking the time to provide your feedback! Click here for entry forms and instructions. You are encouraged to submit innovative ideas from your organizations for consideration and/or to recommend a colleague for recognition. NC-IPMA will announce the awards at the March 2018 NC-IPMA Spring Conference in Atlantic Beach, N.C. We look forward to receiving your nominations, which must be received by March 6, 2018. Please submit them to my attention: mminor@statesvillenc.net. Upon receipt of your entry, you should receive a confirmation email. If not, please contact me to ensure that your information was received. If you have any questions, you may contact me at 704-878-3572. Lifetime Achievement Award - presented to an individual who has made significant accomplishments in the field of public human resource management over the length of their career. Past President’s Award - presented to a Past President of NC-IPMA who has retired from public service and has made noteworthy accomplishments. Myers Johnson New Member Award - presented to a new member for meritorious contributions and support to NC-IPMA during his/her first year of membership. This person will be acknowledged for their time, volunteer efforts, and willingness to help in a multitude of areas. Entry forms and instructions are enclosed. You are encouraged to submit innovativeideas from your organizations for consideration and/or to recommend a colleague for recognition. NC-IPMA will announce the awards at the March 2016 NC-IPMA Spring Conference in Wilmington, NC. We look forward to receiving your nominations, which must be received by Monday, March 7, 2016. Please submit them to my attention: mminor@statesvillenc.net . Upon receipt of your entry, you should receive a confirmation email. If not, please contact me to ensure that your information was received. If you have any questions, you may contact me at 704-878-3572. Note: Entries must be received no later than March 7, 2016. In no more than five (5) pages of doubled-spaced typing, please describe and clearly detail the accomplishments and characteristics of the nominee that you believe justify consideration for the Lifetime Achievement Award. *A current member of NC-IPMA must nominate an individual. Please submit one copy of your entry to mminor@statesvillenc.net . If project/program is not yet completed, briefly describe significant results to-date. · Project/program efficiency - cost effectiveness, staffing, etc. Are you attaching any local news articles about the project/program, or brochures, etc., which help illustrate and provide an understanding of the written description? *Entries are limited to agencies/institutions that have an employee as a member of NC- IPMA. A current member of NC-IPMA must nominate an individual. Please submit one copy of your entry to mminor@statesvillenc.net. Note: Entries for this award must be received no later than March 7, 2016. The individual chosen for this award will be recognized for their meritorious contributions and energy as a new member of NC-IPMA. This individual has graciously volunteered for a number of projects, is always eager to work for the good of the organization, willingly takes on tasks that others would prefer not to volunteer for, and is generally able to work well under pressure. Please describe your reasons for nominating the individual identified above. You may include attachments, if necessary. *A current member of NC-IPMA must nominate the individual. Please submit one copy of your entry to mminor@statesvillenc.net. · Retired from public service in North Carolina. In no more than two (2) pages of doubled-spaced typing, please describe, in detail, any accomplishments and/or outstanding characteristics of the nominee that you believe deserves consideration for the Past President's Award. *A current member of NC-IPMA must nominate an individual. Please submit one copy of your entry to mminor@statesvillenc.net. On Oct. 30, the Equal Employment Opportunity Commission (EEOC) issued a proposed rule under the Genetic Information Nondiscrimination Act (GINA) defining how employers may obtain voluntary health information from employees’ spouses for purposes of a wellness plan. GINA prohibits employment discrimination based on genetic information and generally prohibits employers from obtaining genetic information. GINA makes an exception for situations in which an employee voluntarily participates in an employer wellness plan. The proposed rule allows employers to offer an incentive that is a maximum of 30 percent of the total cost of the plan in which the employee and dependents are enrolled. The proposed rule also requires written authorization from the spouse before any collection of health or genetic information. The proposal is open for public comment until Dec. 29, 2015. The congressional budget deal (the Bipartisan Budget Act of 2015, P.L 114-74) that was signed into law by President Barack Obama on Nov. 2 includes repeal of the Affordable Care Act’s (ACA’s) auto-enrollment provision for large employers, increases premiums for the Pension Benefit Guaranty Corp. (PBGC), and addresses the impending inability for the Social Security Disability Insurance fund to meet its obligations to participants. Within the budget are several provisions that affect employer-provided benefits, as well as a two-year agreement that adjusts spending caps for Fiscal Years 2016 and 2017, equally divided between defense and nondefense spending. The budgetary increases provided by the agreement are fully offset by mandatory spending cuts and other savings, and provide a debt ceiling increase through March 2017. · Repeal of ACA Automatic Enrollment for Employees of Large Employers - The ACA requires that employers with 200 or more full-time employees automatically enroll each new full-time employee into a qualifying health plan (if one is offered by that employer) by the employee’s 91st day of employment and that employers automatically continue enrollment of current employees unless the employees choose to opt out. Employers that are subjected to this requirement are already bound by the health care law’s shared responsibility for employers’ provision, which requires an offer of coverage to these same employees. SHRM supported repeal of the ACA auto-enrollment provision because the requirement could be confusing and cause complications for employees and employers alike. In particular, if employees are automatically enrolled in an employer-sponsored health plan but have coverage elsewhere (such as under a spouse’s plan), they may find themselves in a plan they do not need, a situation that could result in unnecessary financial hardship. In addition, new employees could potentially lose access to health care providers they have long depended on, who may not be participants under the employer-sponsored health plan. Furthermore, for employers who have seasonal workers or workers with variable hours, automatic enrollment creates the administrative headache of determining which employees are considered full-time and eligible for coverage. · Increase in PBGC Premiums - The agreement increases both the flat- and variable-rate premiums for single-employer plans. Flat-rate premiums will increase 22 percent, while variable-rate premiums will increase 24 percent from 2016 levels. It is important to note that these premium increases do not flow to the PBGC to ensure plan solvency. Rather these increases will be used to offset the cost of the budget agreement. · Change in PBGC Premium Payment Deadline - The agreement changes the PBGC premium payment deadline for 2025 and beyond, moving it forward one month. The purpose of moving the date is to include one additional year within the 10-year budget window, thereby increasing the amount of revenue generated to the Treasury. Employers generally are required to make a premium payment by Oct. 15 of each plan year. The legislation would move the payment date to Sept. 15. · Extends Defined Benefit Funding Stabilization (“Pension Smoothing”) - The agreement extends fund stabilization rates through 2019, with rates decreasing thereafter. These rates dictate the levels at which a plan must be funded. Expansions of these rates allow an employer to reduce its funding liability and, therefore, to increase its overall general revenues. With the increase in revenue comes greater tax liability and, thus, more money for the U.S. Treasury. · Allows Mortality Tables for Pension Plan Projections - The agreement allows more retirement plans to use their own mortality tables for plan projections. Normally, the Internal Revenue Service approves plan-specific tables once a plan has a sufficient number of participants to justify the table. This has generally benefited very large plans with many participants. The legislation would expand how a plan sponsor can demonstrate credible information in order to use its own mortality table, thereby increasing the number of plans that use their own tables. Theoretically, this could raise a small amount of revenue by reducing some plan liability and reducing an employer’s pension contributions—thus increasing an employer’s tax liability through the pension smoothing process. · Reallocation of Social Security Disability Insurance (SSDI) Reforms - The agreement reallocates funds among the Social Security program trust funds to ensure solvency of the disability insurance (DI) program for seven more years (through 2022). This prevents the automatic 19 percent cut in DI benefits that would have otherwise occurred when the reserves run out next year. Of interest to employers employing individuals on DI, the bill requires the Social Security Administration (SSA) to test different strategies for incentivizing work for individuals on disability benefits who may fear losing these benefits if their income is too high. The bill also includes new requirements that all disability cases be reviewed by a medical expert before benefits can be awarded. Entry forms and instructions are enclosed. You are encouraged to submit innovative ideas from your organizations for consideration and/or to recommend a colleague for recognition. NC-IPMA will announce the awards at the March 2015 NC-IPMA Spring Conference in Asheville, NC. We look forward to receiving your nominations, which must be received by Friday, March 6, 2015. Please submit them to my attention: Brenda.Dixon@nc.gov . Upon receipt of your entry, you should receive a confirmation email. If not, please contact me to ensure that your information was received. If you have any questions, you may contact me at 919-807-4830. Human Behavior & Work Relationships—Why Can’t You Be Normal Like Me? What are your chances of connecting well with another person? On average, two people have about a 40 percent chance of experiencing a good personality match based on how their personality styles naturally fit together. That means that, most of the time, two people are likely to have a built-in challenge in relating well with each other—unless they understand each other’s personality styles. Personal relationships and business success both hinge on effective communication with others. Dr. Robert A. Rohm, owner of Personality Insights, Inc. and Co-Founder of DiscoveryReport.com – the leading provider of cutting-edge online DISC personality profile assessments, will present the Model of Human Behavior and how we all interact within relationships. This promises to be one session that you will always remember! Click here for more information. Pierce Group Benefits invites you to apply for a scholarship for the NC-IPMA Conference. The scholarship’s goal is to further the education of a public sector employee who has demonstrated great initiative and dedication to implementation proven human resource best practices in the workplace. Click here for more information. As the Affordable Care Act comes into full swing, the role technology plays in how an employer manages their benefit plan will continue to become more and more important. This has created some exciting new technological advances that employers will want to evaluate. Everything from payroll system capabilities to HRIS systems are impacting not only how employers manage the rules related to the ACA but also how they can potentially simplify the administration of their health and welfare plans. We will discuss how new technologies can assist an employer with gathering and reporting the data they need to cost effectively manage their plan and stay in compliance. We will outline the tools for tracking employee hours for measurement periods and other required reform related filings, and why it is important to be evaluating these options now. This program has been approved for 1 [HR (General)] recertification credit hours toward PHR, SPHR and GPHR recertification through the HR Certification Institute. You must be logged in to receive credit! This year is flying by and our 2015 Spring Conference will be here before we know it. We are looking forward to next year’s (2015) conference that will take place March 25-27 at the DoubleTree by Hilton in Asheville, NC. However, in the meantime, we have a lot to do to make it happen and I need your help!! I’ve attached a list of committees including descriptions for each one (click here to download). Please review the list and make your top 2 selections to indicate your interest in serving on a planning committee. We will be forming the committees in the near future, so please submit your selections as-soon-as possible. If you have any questions, please do not hesitate to give me a call (336-242-2246) or email. 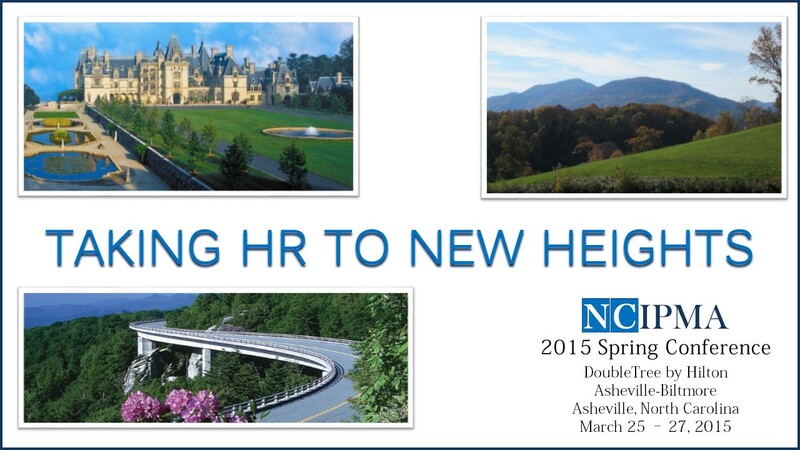 Please save the date March 25 - 27, 2015 for the NC-IPMA 2015 Spring Conference in Asheville, NC.